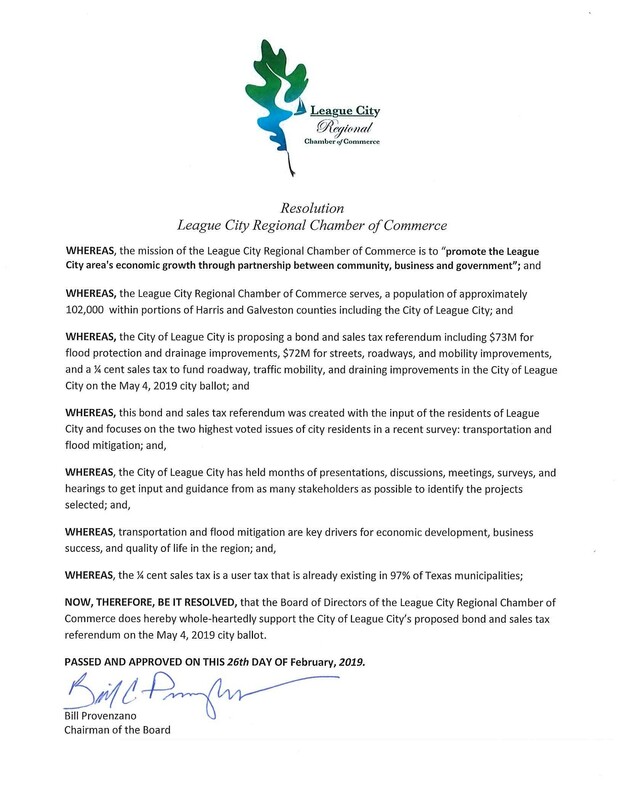 On behalf of the members of the League City Regional Chamber of Commerce, the Board of Directors passed a resolution on February 26, 2019 to support the City of League City proposed bond and sales tax referendum on the May 4, 2019 city ballot. Here is a copy of the resolution. The next Town Hall Meeting is Wednesday, April 17, 2019 - 6:30 – 8:00pm at the Johnnie Arolfo Civic Center, 400 W. Walker Street, League City, TX. Then at 7:00pm, join Council Members and City staff for an update on the City’s Strategic Action Plan and a short presentation on the propositions in the upcoming May 4 special election.